We offer a high quality affordable gourmet treat. It is completely packaged, requires no added labour, and has a history of consistent sales in a variety of retail venues. 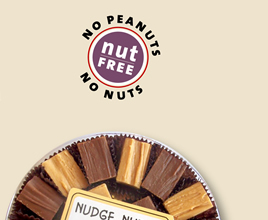 If you think your customers would enjoy NUDGE...NUDGE, just e-mail, fax or call us. We ask you to provide your Vendor Number and we will send you an order form with complete prices and freight charges. Orders may be placed by e-mail, fax or phone. Give us a call or e-mail and we'll send you a price list and discuss what might work best for your group.